To start, the 2430 Chisel Plow provides better soil-breaking and leveling performance, especially in rocky or wet field conditions. It's built to handle tough soils and heavy crop residue while providing operators more control of tillage depth and seedbed finish across a wide range of field conditions. "The new 2430 Chisel Plow builds on many important features of the 2410 Chisel Plow," says Jarred Karnei, product marketing manager for John Deer tillage equipment. 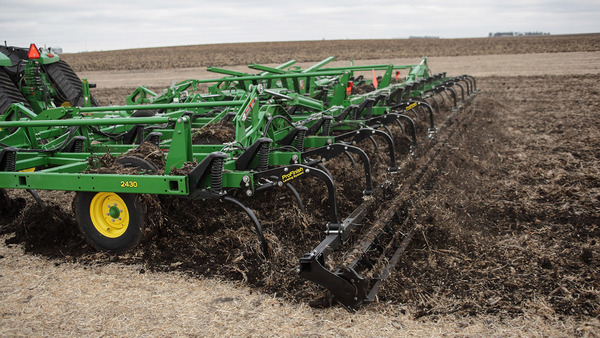 "This includes the addition of John Deere's exclusive TruSet depth and down pressure control system on base equipment and a wide choice of ground-engaging points, spacings and attachments that allow customers to configure the implement to best fit their field-specific soil and residue conditions." "Like the 2410 Chisel Plows, the new 2430 models are built using high-strength steel tubing that provides the superior structural integrity customers have come to expect from John Deere chisel plows," Karnei adds. "These tillage tools are built to provide years of excellent residue incorporation and soil mixing essential to start the nutrient cycling for next year's crop."